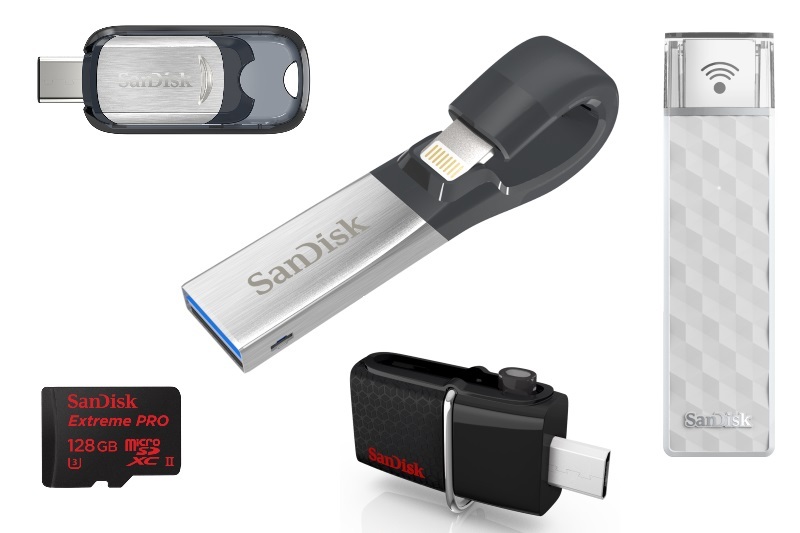 SanDisk has launched a new, slimmed down version of its iXpand Flash Drive for iOS devices, along with a variety of other portable storage products for various purposes. The company cited at IDC report in its launch announcement, which estimated that users would capture 1.6 trillion digital images in 2015, of which 70 percent would be taken on mobile devices, as evidence of the demand for mobile storage products. The new iXpand is completely redesigned and rearchitected, according to the company. The body is now only as wide as a standard USB plug, and the Lightning connector on the other end has been designed to work without needing to take an iPhone or iPad out of its case. The device will be available in storage capacities up to 128GB and does not have a battery and require charging, unlike the first-generation model. USB 3.0 speed is now supported when the device is plugged in to a PC. Pricing for the iXpand Flash drive starts at Rs. 3,990 for 16GB and goes up to Rs. 9,990 for 128GB. SanDisk’s free companion app allows users to see music files stored on the iXpand Flash Drive as well as on the device’s iTunes library and play both. Users can also take photos and record video through the app in order to save them directly to the iXpand Flash Drive, which keeps space clear on the iOS device and allows for easy sharing. The app shows you when you last backed up your data, and encryption allows you to mark specific files which can only then be opened if you use a passcode or fingerprint. A new 200GB version of the SanDisk Connect Wireless Stick was also announced. This product lets users share files across devices regardless of OS or platform, using Wi-Fi. The bundled app now supports media streaming using Apple’s AirPlay, Google’s Chromecast, and Amazon Fire TV. It costs Rs. 9,990 and will be available exclusively through Amazon in India. SanDisk also unveiled the new Ultra USB Type-C Flash Drive, designed for use with newer smartphones and PCs, including ultra-slim laptops and tablets which have only USB Type-C ports. USB 3.1 Gen 1 speeds are supported, and capacities range from 16GB to 128GB. Prices start at Rs. 1,290 and go up to Rs. 4,290, and all versions are covered by a 5-year warranty. The SanDisk Ultra Dual USB Drive 3.0 offers a standard USB 3.0 connector on one end and a Micro-USB connector at the other, allowing for use with USB-OTG compliant devices. The 128GB device costs Rs. 3,390 and is available only on Flipkart for now. Finally, the company also announced a new Extreme PRO microSDXC UHS-II card, which it claims offers the world’s highest transfer speed. The card is designed to be used with action cameras, drones, and other devices which push 4K or high-framerate video, resulting in massive file sizes. The company says that this microSD card can withstand shock, extreme temperatures, water, and even x-rays. It comes with a USB 3.0 card reader and a lifetime limited warranty. The 64GB version costs Rs. 9,990 while the 128GB version costs Rs. 18,990.